Wait. We just read one of those links again. The Jonas Brothers and the Beach Boys are teaming up for a Reagan tribute? And there will be a six-foot-tall birthday cake with a 50-pound chocolate eagle?! Screw accurate reflection on his policies. That eagle means America. Happy birthday, Gipper, and happy Friday to the rest of you! Today is the Day of Departure in Egypt, which is still in chaos more than a week after mass protests broke out calling for Hosni Mubarak's ouster. Seems like the CIA knew this was coming -- just not when. 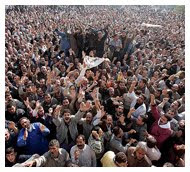 On the day of the largest demonstrations, Mubarak announced he wouldn't seek re-electio n, ending a more than 30-year reign. Many protesters want him out of power immediately. At least five people are known to have been killed, and hundreds of others wounded in the protests, thus far. Americans and other foreign nationals are being urged to or have already left the country. AC and his camera crew were mobbed/attacked and the incident has received a lot of coverage... for better or worse. Journalists are definitely not welcomed in Egypt now (here's a list of what's happened to them so far). Obama is working behind the scenes to have Mubarak resign "immediately," and an interesting article was in Playbook this morning about his perspective on this business (we said "interesting," not accurate). Hillary called all her ambassadors back from overseas for a breakout session. Yemen's president also confirmed he wouldn't run again and Jordan's king reformed his government in response to protests stemming from higher fuel and food prices and calls for more political freedom. For the second time, a federal judge has declared the health care law unconstitutional. U.S. District Court Judge Roger Vinson ruled the individual mandate unconstitutional, and that the law should be repealed in its entirety, rather than this single provision. The Justice Department will likely appeal to the U.S. Court of Appeals for the 11th District. All 47 Republican senators voted for repealing the health care law. No Democrats supported the repeal. What's Mitch to do now? The EPA wants to scare anti-government people by protecting those same folks from cancer-causing contaminants. Oh, the horror! Meanwhile, GOP'ers want to take that power away from the administration. Obama's economic team unveiled Startup America, an public-private initiative designed to boost entrepreneurship and promote job creation. U.S. 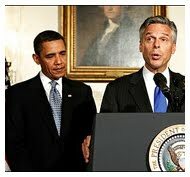 Ambassador to China Jon Huntsman will be stepping down in the spring to for a possible run for the GOP presidential nomination. Now, the big question -- how does he explain his loyal service in the Obama administration as a plus to the Tea Partiers? Speaking of the Tea Party, the surviving GOP moderates, if that's what we can call them, will be facing downright ugly primaries next year. Also, they want their money back, Scotty. The DCCC has placed ads against 19 House Republicans in the first salvo of the 2012 campaign cycle. Charlotte, NC was chosen as the site for the 2012 Democratic National Convention. Also, here's Politico's handy list of the ten most competitive Senate races. Republicans are reaping the benefits of the majority -- or are they? House Democrats are calling out their counterparts for not placing jobs as their top priority, wasting valuable time on trying to repeal health care reform and emphasizing hot-button issues like abortion. Debbie's looking out for women -- and it appeared the GOP was backing down, but, THEY'RE NOT. (But attacking Planned Parenthood is apparently all the rage.) That's compassionate conservatism, for ya! Oh, and look: the Heritage Foundation is doing a fantastic job handfeeding the GOP. 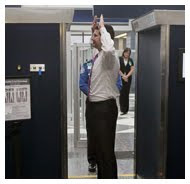 Those pesky TSA body-scanners are still in the news -- thanks to Michele Bachmann. Not a pretty sight. If you manage to get through without a body scan, pick up Rummy's new, totally awesome revisionist book. He criticizes EVERYBODY. Gramps had a simple response to the former defense secretary. The National Prayer Breakfast was held Thursday. Obama dedicated a portion of his speech to profess his Christian faith. Why, you ask? One in five Americans STILL believe that our president is a Muslim. Four years since the beginning of his campaign and millions still believe the incredible truthiness of internet nonsense. Looks like John McCain is relaxing his anti-Obama stance; they had an afternoon meeting to discuss immigration and the crisis in Egypt, among other things. 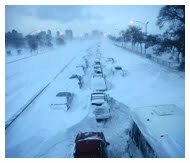 New GOP Senat or Mark Kirk, however, let the rage fly when he blamed last year's climate change legislation failure on Al Gore's separation from Tipper. Wow, that's hitting a low mark, Mark. Us D.C.'ers were spared most of the effects of that massive storm that slammed the rest of the country. Meanwhile, a devastating cyclone struck Australia, just as that region recovers from months of flooding. The Turner Report... has Bieber fever. Just like Pauly D! Seriously, we can't stop finding friggin' Bieber stories. Biebs on the Super Bowl... Biebs switching places with Jon Stewart... Biebs entering the public policy sphere... what the heck do we do? Should we drink lots of liquids? Go on bed rest? Please help :( the Bieber fever burns! Chuck Schumer is always looking for the spotlight. This week, one of his own constituents, Snooki, denied him that photo-op. She was also in attendance at the Washington Auto Show and gave some informative political analysis. Well, thank GOD for Bill O'Reilly, because he's finally proved the existence of the dude, once and for all. Irrefutably. It finally happened: Michael Steele meets Michael Steele. Because the Palins have resigned themselves to the entertainment industry, this story belongs down here. How about some trademarking? Y'know, we heard that Rosetta Stone was hiring in DC. Looks like they've got themselves a great new candidate! "Young, motivated, bald former Mayor seeks any kind of employment. Seriously. Any." Are you using Flickr? Here's a story that will make you want to back everything up if you are a user of their service -- or any other platform. Hell, go back up all of your stuff right now. Trust us. Speaking of information, there are shocking new troubles in Facebook privacy-land, spurring Congressional intervention. Maybe you should check if you are inadvertently on this "dating" site, by the way. Ruh roh... Bing, you done effed up, and Google is not going to let this go. Kenneth Cole made a major Twitter oops -- yesterday, they tied the uprising in Egypt to their new spring collection, which was a wee bit awkward, dontcha think? Luckily, the fake Twitter account spoofing them has already been created. Thank you, Internet! Thousands were up in the wee hours of Thursday to pre-order their Verizon iPhones. But those of you who download gigs and gigs and gigs might be throttled before you even start. Oh, and Verizon, you might want to do a better job handling your White House account. Your tech lesson of the day: the National Organization for Marriage got owned by a web comic artist. 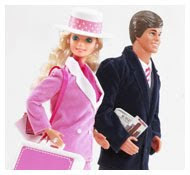 In a social media/ad campaign to rival... pretty much anybody's, Mattel has taken the Ken/Barbie romance rekinding to a whole new level. There are some Mattel social media interns having a GOOD TIME with this one. However -- and there's always a however -- why should a doll have to choose between love and career, hmm? Girl, listen to Queenie: if he's gonna stand in the way between you and your 8 million careers or whatever, he ain't worth it! Even if he will stalk on FourSquare and literally say whatever you want him to. We thought this was a cheesy Valentine's Day thing at first, but this Go Red Happy Hour is actually an AHA fundraiser. Eat, drink and... eat! Literary nerds, this weekend is meant for you. The AWP conference is happening, which means nerdy events are going on all over this super-smart city. Example: Split This Rock Poetry Festival, Literature Party!, The Literati Gong Show... longtime TR fans know that Queenie's English-major self is geeking out like crazy for all this. Virginia is FABULOUS. DJ's, runways, makeovers and more are happening at Crystal Couture, which closes tomorrow evening. And find amazing, amazing steals at the Alexandria Boutique Warehouse Sale in Old Town (seriously, go, it's right off the King Street metro). Queenie will be having a field day. For some reason, it's orchestra season: check out the GW University Orchestra, the U.S. Army Band Chamber Ensemble and the U.S. Marine Chamber Orchestra, culture geeks! Oh, shoot... we don't have anything for you to do on Sunday. Guess you should go watch a movie. Hah hah, just kiiiiidding! Queenie is, uh, not really a football girl (say hi if you see her at the Caps/Penguins game on Sunday -- rockin' a Backstrom jersey, obviously), but she supports any event with beer and snacks and silly commercials and anthems by Lil' Wayne and social media strategies. Look for your favorite bar on this list (or this list) and get there early. We really have no other advice. Egypt stays at the forefront, health care and jobs reign supreme but the Gipper will be staring you down on FOX all weekend long. Just warning you, folks! 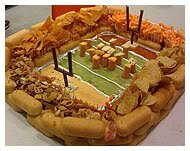 Have a great weekend and, um, goooo football! Get a home run! ...Or something!